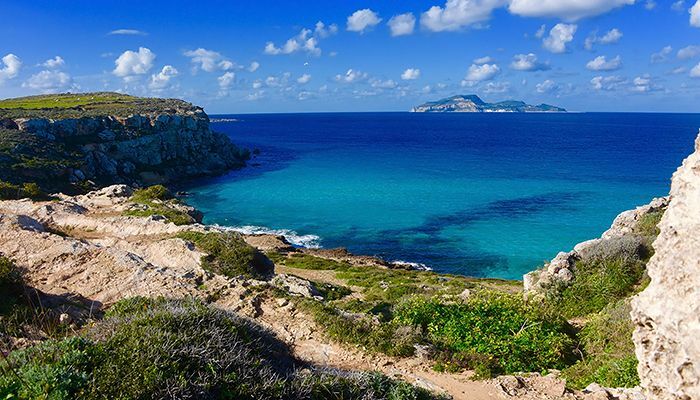 The Egadi islands (meaning islands of goats) are the small archipelago that consists of three main islands Favignana, Levanzo and Marettimo, and two islets, Formica and Maraone. These five small mountainous islands are situated just off the northwest coast of Sicily in the Mediterranean sea. The Egadi islands will seduce you with the beauty of the coastline and crystal clear sea. The history of the islands is closely linked to the traditional tuna fishing. However, their history goes much further back. The archeological evidence suggests that the islands were occupied already in the Stone age. The legend says that the Egadi Islands owe their names to the nymphs born from the union of the sun god Helios and nymph Neerea. 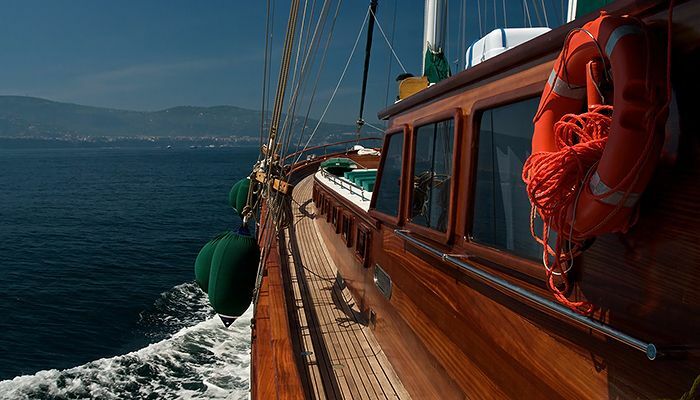 Preserved and unspoiled wilderness, encounters with endangered species, long beaches and isolated bays, small archeological treasures, deserted mountain paths, and extremely relaxing atmosphere will make cruising in the Egadi archipelago an unforgetful experience. 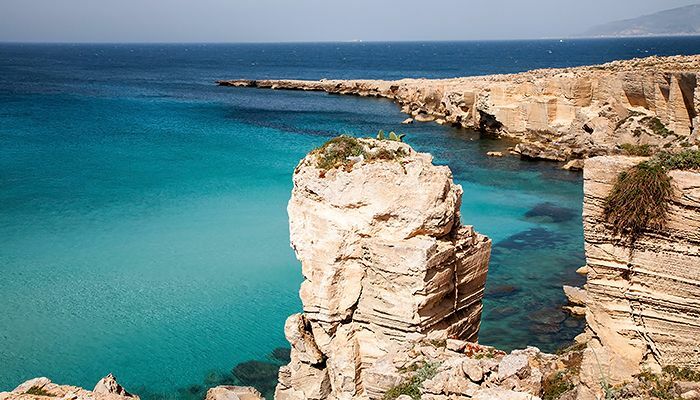 The cruise begins in the coastal town of Trapani on the northwestern coast of Sicily, a beautiful historic center and gateway to the Egadi islands. Trapani boasts a long history which, according to myth and legend, began when a giant scythe fell off the back of the goddess Demeter’s chariot as she roamed around Sicily in search of Persephone. The port was an agricultural center for the hill-top fortress town of Eryx (modern-day Erice) and became important for tuna fishing and salt production. Trapani’s old town center, which has been restored, is well worth the visit and is an essential point of departure for the magnificent Egadi Islands, just a few miles off its coast. 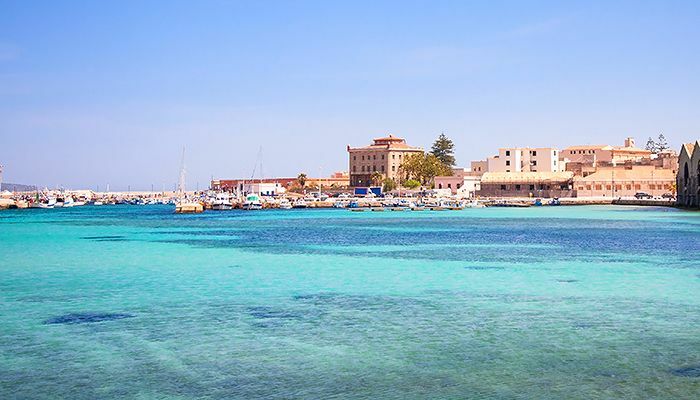 Nearby is the perfect beach of San Vito Lo Capo, the wine town of Marsala with its impressively restored old town center and the ancient Temple and Amphitheatre at Segesta. On the way to the first of the main Egadi islands, you can stop by the two small islets of the archipelago, Formica and Maraone. Maraone is uninhabited, really beautiful, and a part of the protected natural reserve. The islet is perfect for relaxation, swimming, and a great place for diving enthusiasts. Formica is the slightly larger island, which was inhabited by many ancient peoples but abandoned over time. The place has a special charm due to its calm atmosphere. It hosts a lighthouse, an ancient and traditional tuna fishing net and very old fishermen’s habitations. Favignana, or “La Farfalla” (“The Butterfly”), as it is often referred to due to its butterfly shape, is the largest, most populated and also the most important island of the archipelago. 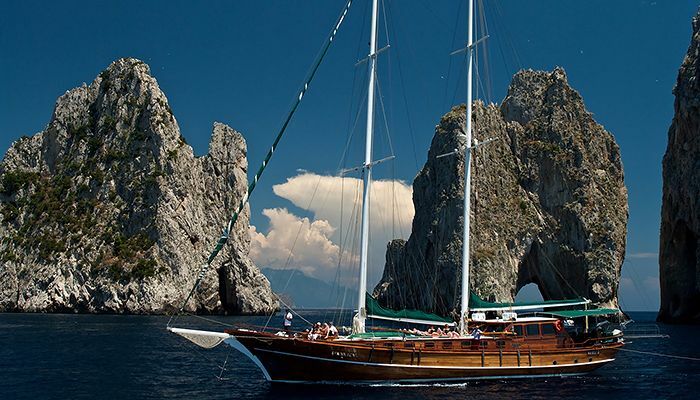 It is a popular destination thanks to its crystalline azure waters and picturesque bays such as Cala Rossa. The crystal clear waters offer excellent swimming and good scuba-diving possibilities, especially in the various sea caves. The main town, also known as Favignana, has a small port and is dominated by the Fort of Santa Caterina, originally built by the Arabs as a watchtower, enlarged by the Normans and then used as a prison by the Bourbon Kings. With its two main piazzas, low Mediterranean houses, cobblestone streets, and church square the town testifies to the ancient wealth of the island. Levanzo is the smallest of the main Egadi islands but in no way less inviting. The majority of the coastline consists of dramatic rocky cliffs but the island also hosts a few lovely beaches. 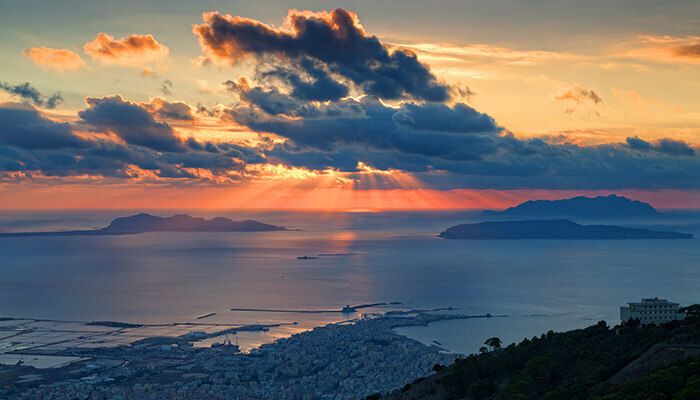 The island is very hilly, though its highest peak “Pizzo dei Monaco” only rises to 278m. Levanzo hosts the famous archeological treasure, the Paleolithic cave “Grotta del Genovese” with prehistoric paintings depicting scenes from daily life including fishing, animal husbandry, and dancing. Here you can have all the peace and quiet in the world, visiting Levanzo will render stressful city life but a distant memory. It is a perfect place for relaxation, enjoying good food, swimming in secluded bays or taking a hike. 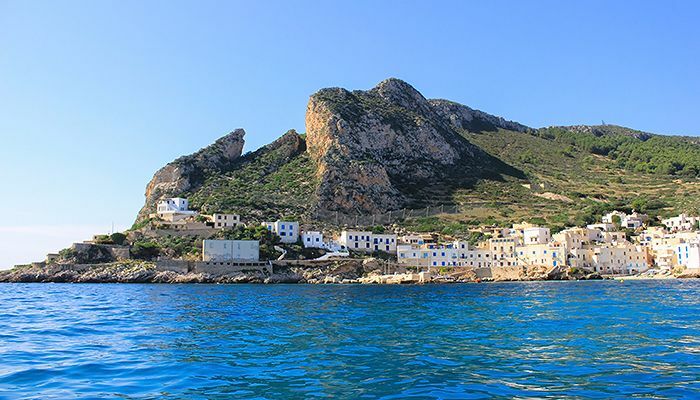 Marettimo is the westernmost, the wildest and most isolated of the Egadi islands, lying a full 15 miles off the coast of Trapani. As such it is wonderfully unspoiled both in terms of its marine life and its rugged mountainous hinterland. Dramatic limestone cliffs plummet towards the cobalt-blue sea, endless panoramas abound, and mountain paths offer wonderful walking. You can visit numerous caves one of which, the “Grotta del Cammello”, hosts a pebbly beach and the remains of a Roman settlement. In the small village of Marettimo, you can spoil your taste buds with some fresh seafood. And most of all you can enjoy pristine, crystal clear waters and wealthy vegetation. Besides the beautiful gardens, you may be lucky enough to see the monk seal, a fascinating endangered animal which found its safe home here and is just curious enough to make this exciting encounter possible.